তলবটা বেশ জরুরী মনে হচ্ছে? কিরে, শারলক হোমসের এর মতো কোথায় নিয়ে চলেছিস বলতো? স্যার, এখানে আপনার প্রয়োজন। তাই দিল্লী থেকে আপনাকে ফিরিয়ে আনতে চাই। তিনি জবাবে তেমন কোন উৎসাহ দেখাননি। তার প্রতিক্রিয়ায় কিছুটা বিস্মিত হয়েছিলাম! পট পরিবর্তনের পর তোরা সবাইতো ডাকের অপেক্ষা না করে ছুটে এসেছিলি বিপ্লবকে সমর্থন করে। মুক্তিযোদ্ধা সংসদকে পুনর্গঠিত করার কাজে এবং বিভিন্ন দেশপ্রেমিক এবং প্রগতিশীল রাজনৈতিক দল-গ্রুপ এর নেতা-নেত্রীদের সাথে দেশের ভবিষ্যৎ রাজনীতি নিয়ে আলোচনার জন্য যোগাযোগের ব্যাপারে তোর অবদান কম ছিল না। ৭ই নভেম্বরের পর ভারত থেকে ফিরে জেনারেল পদে উন্নীত হয়ে জিয়ার বিশেষ আস্থাভাজন CGS হঠাৎ আমাকে ডেকে পাঠালেন কেনো, কি প্রয়োজনে সেটাই ভাবছি! I am flying on board a London flight. Abba, Minu Fuppu, Bappi, Shapan, Mohua, Keya, Shangita and my all time companion Col. Mahbub came to see me off. A number of few very close friends from the armed forces had also come. Sitting in the mechanized flying crain I was quitely thinking about every eventfull moment that I had passed through in Dhaka. At one time I fell asleep. Through out the flight there was no darth of warm hospitality starting from the captain and in flight crews. They were doing this at their own. Because, in status I was not a VIP but an ordinary passanger like others. The flight landed at Theath Row airport in time. Khalamma, Nimmi and Manu came to receive me. Nimmi embracing me started crying. Manu also hugged me with wet eyes. Khalamma placed her hand on my head and welcomed me. Manu is our driver. She takes us around when ever we visit London. Most of the roads and lanes of London are at her finger tips as she almost grew up in London from her childhood. Indeed, she is also a good driver as well! We reached home. On the way Nimmi enquired about welfare of all back home. After reaching home I called at Benghazi and informed that I have reached London and within a week shall be at Benghazi along with Nimmi In Sha Allah. Pasha informed after returning from the country both the brother-in-laws mostly remain closed door in their flats. No problem, once I come the doors would open. After spending one week in mids of the warmth of close friends and relatives we finally reached Benghazi. All got alive having both of us among them hail and hearty. All though Zia had given his words to Rashid and Faruk that once the multy party politics resumes in the country they would be allowed to return to the country to do politics but I think at the right time he would disown his words. If they try to be adamant then he might even take extreme measures against them though with out us Rashid and Faruk’s politics would not pose any threat to his own politics. Had he been true to himself then after knowing that we have a distinct political agenda he never even uttered a word what to talk about any such offer while taking to me. Due to popularity of 15th August change, it is only us and Khandakar Mushtaq who could counter Zia in politics. Knowing that, Zia completely avoided that issue while talking to me. Rashid and Faruk might join hands with Mushtaq but Zia is also fully aware of the fact that with out us Rashid and Faruk would not be considered as heavy weights in politics by Mushtaq. I also think that Zia would not allow the embraio of Khandakar Mushtaq’s party the Democratic League to flurish after his compromise with India. I had talked with Shishu Bhai frankly about my apprehension wanted to know his opinion. But he avoided to give any answer and remained quite. I took his silence as a positive answer. Mahbub agreed with my apprehention. Cunning fox in the garb of a tiger is playing a dangerous game but the end of this game would not be good for him and for the country it would be horrifying. What would happen or not happen to Zia that is not our concern. At this moment we all must think what is going to be our future decision? Are we going to accept Zia’s propossal or not. Gen. Zia is not arranging to keep us abroad temporalily but permanently in a way so that we don’t go out of focus from his radder. It is also not palatable to Zia that we all stay together at a safe aboard. Whatever he might have said, lets have no doubt that he would never take us back in the army. It would not be possible for him to do politics with us since he has compromised with India and decided to bringing back Sheikh Hasina as their pawn to be his cohabitant in the political chess board. As Zia had already made a deal with India to rehabilitiate Awami-Bksalites again in the main stream of national politics in that scenario should we decide not to accept his offer of foreign assignments as diplomats and dares to get back to the country against his will to do politics separately then, our fate would be worse than JSD and Sarbahara party during Mujib’s reign. The fate of Mushtaq’s declared Democratic League in future will prove that. 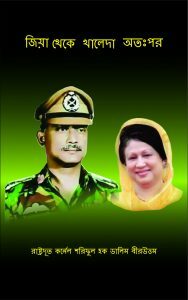 I also believe though Mushtaq might get some support from some of the oil rich Gulf States and Western powers including America but to all of them at the moment Zia would be more prefered being the ‘Strong Man’ controlling the bastchion of power that is the armed forces of Bangladesh like many other 3ed world countries. The way Gaddafi had welcomed us, I do not think most of the other leaders of the world who believes in the politics of compromise would be doing that. It wouldn’t be possible for us to take refuge in any communist or socialist countries as well though Rashid and Faruk attempted to project all of us as communists to Gaddafi and other influential members of his Revolutionary Command Coumsil misinterpreting our progressive out look and egaliterian nature of politics. In case we decide to live here then we have to cohabit with two unscrupulous brother in laws who by now had all ready taken some initiatives at their own tarnishing our image and in future might take more such initiatives eroding our image even further. Therefore, it would not be possible to stay here any longer. Besides, there is a gulf of difference in political out look and ideals between them and us. After considering all these realities I think, we have no other alternative but to accept Zia’s offer. If this offer is accepted then our personal security would be assured to some extent and at the same time we would be in a position to contribute something for the interest of the country and the nation. The most important factor in this case would be that we shall be able to maintain uninterrupted contacts back at home. We shall also be able to develop personal relation with the diplomats of the important countries of the world. Besides, this would also provide us the scope to deepen our knowledge about world politics. Presently, attempts are being made in many ways to transform the world into a ‘Global Village’. So in future should an opportunity avails itself for us to do politics then we must be aware of ongoing world affairs. After accepting the assignment of a diplomat instead of getting restricted only to ‘Dinning and Wining’, we must endeavor to gain knowledge about the flow of events at evry noock and corner of the world, currents and cross currents, internationally conflicts based on interest and resolution, about various kind of aggression, for one’s self interest unethical give and take and coexistance, equations between the ideologically opposite powers etc and in these ground realities how can the interest of Bangladeash be achieved. Should we fully utilize this opportunity to equip ourselves better then in future if Allah again gives us an opportunity to lead the national struggle then we shall be much more matured to provide effective leadership to materialize the spirit and dream of ‘71. No one said anything against what Pasha had stated. Rather, all had supported him. Therefore, decision was taken that even if Rashid and Faruk refuse the offer and decide to live in Libiya, we all shall accept diplomatic assignment offered by Zia and leave Libiya to join different Bangladesh Missions abroad as diplomats. The aninomous decision thus taken was conveyed to Gen. Zia that other than Rashid and Faruk rest all of us have agreed to his propossal to take up diplomatic assignments. We knew that after receiving our consent Zia would arrange to send our posting orders at the earliest. Keeping that in mind, the decision was also taken that before leaving we must clarify some important issues with the two brother in laws holding an open and frank discussion with them. As decided, we got togather in a meeting. I was requested to be the spokesman to talk with them about our decision and on other issues. We have decided to accept Zia’s offer to take up diplomatic assignments. The decission has been conveyed, You and Faruk decided to live here. Therefore, before leaving we thought it would be prudent to convey our feelings about your attitude, initiatives and actions on some issues of importance. Why we have decided to leave and why you two have decided to stay back that needs no further elaboration or altracation. Since the days of liberation war, we all had been the members of an covert organisation founded on a clear aim and ideals. We have a distinct well thought of vision or a dream if you like to be accomplished on a deliberated work programe. Both of you are not a part of that even then we had staged the sucessfull revolutionary uprising of 15th August jointly on the basis of a minimum action plan. The basis of our unity was patriotism and religious values on which our spirit of separate self identity, ‘Bangladeshi Nationalism’ has evolved over hundreds of years in the historical process. Infact, this was the spirit of’71. When the Indian Chanakyas chalked out a far feteched blue print disregarding this spirit in coleboration with the power hungry national vested interested groups of boot lickers to turn Bangladesh into a client state at that point of time we along with other concious freedom fighters devoted ourselves covertly getting organized to counter that blue print under the cover of the liberation war. There is lot of difference between us in mind set, thoughts and ideals, outlook about life about which people at large not aware. They view all of us to be the same. But after 15th August you had taken some initiatives unilaterally which had tarnished our image. All of a sudden, you two without any discussion with any one of us went to the American Embassy at Bangkok and asked for political asylum huimsically without thinking about the possible outcome and future. There after, the weird live interview in BBC. The drama that you and Faruk had staged this time what benefit have been achieved out of that? Perhaps due to this event some more revolutionaries would become sacrificial goats in Zia’s hand! Whatever hight Zia has attained today, he had climbed up to that deceptively using us as his ladder. Unfortunately, this fact is not known to the people. We have no scop at present to tell the countrymen that he is a traitor(Munafiq). In view of this the only way to couter Zia would be at an appropriate time his real character should be exposed unmasking him politically. Although, Zia had committed to Faruk before he left the country this time that once open politics resumes in the country you would be given the opportunity to do politics, but we think, he would not give that opportunity. At the same time, he will not allow Khandakar Mushtaq also stand up as his political opponent. Anyway, whatever unwarranted activities that you have done so far it wouldn’t be possible to ubdo those, but we request you not to repeat that kind of activities in future projecting all of us as laughing stock. As our names are synonymous with you two therefore, certainly we have a right to put up such a request. At present silence would be virtue. If ever the idea of countering Zia politically gets into your heads then you would be finding our doors open to you in future. Before leaving, with gratitude we shall logically make him understand why we have taken our decision. I am compelled to say one more thing to Rashid, it is not right to have the impression that we all are communists just because we have intimate relation with Col. Taher, Col. Ziauddin, Maj. Jalil or Shiraj Shikdar. You are understanding fully well, why did I had to say this. After returning from Dhaka, Rashid tried to convince Gaddafi that we are responssible for the failure of Faruk’s mission because we all are communists. The reason he gave that we have intimate relation with Col. Taher, Col. Ziauddin, Maj. Jalil, Shiraj Shikdar including the leaders of all leftist parties and groups. We still maintain contacts with them regularly. I am communist and expressed my desire to go to People’s Republic of China, that is why Zia had posted me to Piking(Beijing). His reasonings were like an age old saying, ‘A mad can say anything as the goat eats everything’. Both you and Faruk managed to reach Mujib Nagar almost at the fag end of libaretion war therefore, it is but natural that both of you don’t know many things that had happened during the war. Should you decide to proceed any further politically, then you must know all of that. One more thing I would like to say to both of you as food for thought if you like. The way Gaddafi along with the army of Gamal Naser ousted King Idris staging September revolution, in the similar way even millions of Dollars are spent it would not be possible to remove Zia from power at present. Only if the people can be organized country wide politically to unmask Zia it would be possible to fight against Zia. People must be apprised convincingly that Zia is doing only power politics after compromising with the anti national vested interested groups within the country and India, the arch enemy of Bangladesh outside. The interest of the country and the nation could never be served with such unholly poitical allyance. Roming around the villeges sporting a torn vest along with his henchmen with a spead on shoulder to impliment his cannal digging and reconstruction of roads and culverts is nothing but a self centered gimic to earn cheap popularity. The seeds of unhealthy political culture that he is sowing in the newly independent Bangladesh would give birth of a full grown huge poisionus tree. The ominous deep dark shadow of that tree would gradually engulf the country and the nation. In that dark hallow the people will loose sight to find the right path for a bright future. Taking advantage of the blind people in a dark ally India would strangulate the whole nation and there after the Chanakyas would start tightening the belt with carefull mechanizaton through their lackies and so called independent Bangladesh would become a client state of India. Thus, they would be fullfiling their charished blue print of ’71. Zia had harvested all our hard work, blood and sweat! Against this reality there is no scope of any short cut in the politics, we must understand this hard fact. Those who would be having the vision and thotough understanding of the flow of political current in future with prudence and courrage would be the accepted leaders and caders who would be the vanguards organising an astounding sucessful revolution to change of the fate of the deceived nation and regain real independence defeating the userpers. At the end, I invited question from all present. But none had any so, meeting came to its end. Rashid and Faruk quitely left for their appartments and rest of us in sat around tea and cofee in a relaxed mood discussing lighter topics. Nimmi, Ranu, Lizi, Lily, Hena, Nafiza came and joined in. News came from Dhaka, Lt.(R) Shamsher Mubin Choudhury(Nick name Sheru) is coming with our posting orders issued from the Foreign Ministry. We were brought up togather since our child hood. He and Shapan were almost of same age. His elder brother Nasrul Mobin Choudhury and I were contemporaries in age. In ’71 Sheru was serving as a young Leiutinant in the same Regiment with Zia. He was injured in the battle of Kalur Ghat and became a prisoner of war. He had to spend almost entire period of 9 months till Bangladesh became independant in the CMH under captivity. After liberation we went togather to GDR for advanced treatment. On return due to physical disability his services was placed with the Foreign Ministry at his request. After the battle of Kalur Ghat Zia, Shafiullah, Khaled and all other commaners realised that it would not be possible to achieve independence defeating far superior Pak Army in fronal engagement so, they assembled at Teliya Para and decided to organize the forces ubder command for fighting a long drawn Guerrilla war. Meanewhile, the elected senior leaders like Nazrul Islam, Khandakar Mushtaq Ahmed, Tajuddin Ahmed, Kamruzzaman, Mansur Ali, Samad Azad, Col(R)Osmani and a few others of Awami Leauge in the election held under Gen. Yahiya Khan’s LFO and had won single majority after negotiation with the Indian government and signing 7 pont agreement decided to form the Provisional Bangladesh government in exile. Nazrul Islam as the acting President and Tajuddin Ahmed as the Prime Minister hoested the flag of independent Bangladesh and they along with other designated Ministers took an oath in a simple ceremony held at Bayiddanath Tala at Meherpur. Later Bayiddanath tala was named as Mujib Nagar. But the seat of newly formed provisional government was shifted at 58 Bali Ganj in Calcutta in a two storied building. Why have you all decided to leave Libya? You could stage revolution in Bangladesh staying here. I could also help my brothers in every ways whatever possible. With gratitude I would like to say something on our behalf should you allow. Please, feel free Gaddafi gave his consent. Staying at Egypt under the patronage the way you had staged the successfull and over threw King Idris, in the same way it is not possible to remove Gen. Zia from the power at present that I supppose Col. Rashid and Col. had realised after visiting Dhaka this time. Though, due to us Zia is in power today but having betraying us now he is trodding his own chosen path. Unfortunately, as this is not known to the people they still consider him to be one of us. This reality has complicated the situation at present and taking full advantage of this complexcity Zia very cunningly is up to consolidate his position ruthlessly. In such a precarious situation even if we succeed to remove him through an armed encounter but it would not be possible to resist Indian aggression with a devided nation. Therefore, first and foremost we have to confront him politically to unmask his real face before the people only then any revolutionary action would be successfull. Not before that. The main stem of the revolution and revolutionary strategy and tactics in every country should be the same that is illogical. Say for example, main force of Russian revolution had been the labor class as it was a industrially developed country. But the main force of Chinese revolution was the peasentry. Similarly after the independence we organized a secret organization within the armed forces with tested freedom fighters that was the main force of our revolution. Zia had commited willingly to be the member of that organization that is why we made him to be the rallying figure and moved ahead. But once we installed him at the center of power at an opportune moment he moved away from us and decided to go on his own way. Not only that he had depleated our organizational streanth in different ways due to his conpromize with India. But still the people think that Zia is one of us. Therefore, in this situation I am saying it again, our fore most task would be to unmask his real face before the beople and that has to be don politically. Only after that it would be possible to take any revolutionary step to overthrow him from power. But at this moment he wouldn’t give us that opportunity in no way. So, we have to wait for the right opportunity. Lack of patience would only be westage of streanth but shall not gain anything. He is fully aware that we are his main opposition therefoe, if we decide to stay together in your country then he would be extremely careful about our movements and communication with Bangladesh. But if we agree to his proposal and join different Bangladesh Missions abroad with diplomatic assignment then it would be helpful for us to remain in touch with our contacts in different sectors back at home. All though he has given his word to Rashid and Faruk that he would not create any problem for them to do politics once open multy party political activities resum in Bangladesh, but we think he would definitely do that. We also think, Zia would not allow Khandakar Mushtaq and his party to grow strong as his copetitor. Moyammar, there is not much difference between your ‘Green Book’ and Mao Tse Tung’s ‘Red Book’. The only fundamental difference is that ‘Allah is only Sovereign’. You must have realised that all though Muslims are the 2nd largest community ib the world but to day most of them are Muslim by birth not in practice. You have taken comendable intiative to change into practising Muslims to reestablish lost heritage, pride and the truth all over the world. At the same time, You as a revolutionary is generously supporting all those oppressed who are fighting against imperialist aggression and their local vested interested lackies for freedom. This is also praiseworthy. We also believe like you that it is only possible for the entire humanity to attain total freedom spiritually and materially only through the commandments of the creator. Only by following His commandments in true letter and spirit every human being can establish him or herself as His Khalifa and would be able to fullfil the ordained responsibilitis for which we have been sent to this world. Why I am going to China, this is related with one incident. After friendly relation between Pakistan and People’s Republic of China was established, Gen. Ayub Khan sent a deligation under the leadership of Pir Pagara. Maulana Bhashai was one of the member. On return he told me that after visiting China he understood as to why our great Profhet had said to gain knowledge one has to go to China. After a long drawn revolutinary struggle to rebuild the war ravaged country and the nation the Chinese leadership is working shoulder to shoulder with the people day and night being self relient to stand up on own feets. Because they believe that being dependent no nation or country could not ever stand up right with heads high. They can’t enjoy the benifits of independence. Therefore, all the young, middile aged and old regardless of gender unitedly are working hard relentlessly to the best of one’s ability depending on their own resources. Our journy is a long drown up hill task. Now, please express your views how did you find our country and people? Subhan Allah! What ever I have seen going around your country that had reminded me that you are implementing exactly what The Holy Quran and my Rasul Sallahussalam in his Hadis had commanded for every Muslim to do for the betterment of the nation and the country except the aspect of Iman! Respected(Mohtarem) Maulana, I read the Holy Quran and Hadis with due respect and had learned many things and watever I learned I am sncerely trying to practice that on ground for the betterment of my people. About the Iman I take the previlage to say that no human being is in a position to tell who is an Imandar and who is not as only Allah has that prerogative. After hearing what Chairman Mao had said all the proclaimed custodians of Islam(Bujurgs)present were siting with their heads down. Since I heard that episode, I all along charished a desire to visit China if the oppurtunity presents itself. This is why I decided not to let the opportunity offered by Gen. Zia go out of hand. You have develop a close relation with us with sincereity and warmth, we also sincerely respect you as a rare revolutionary leader selflessly dedicated not only uplift the fate of Libyans but to provide all kind of support gallantly taking the risk of life disregarding the wrath of all the imperialist powers to the Muslims at every corner of the Globe and the oppressed people in their struggle for imancipation. In this regard I would like to leave some food for thoughts to ponder about. Around the world particularly in the under developed countries thousands of children are made Quran e Hafez providing them two squire meal and shelter in the Maderas of different fikras with the fund provided by Libiya and other oil rich states, many mosques are also built. This is surely a laudable endevor. But are they being taought about the real messege and creed of Islam such as-equality, human values, unity of Iman, the conflict between truth and false, courrage to be out spoken for the right against wrong, brother hood, conciousness about society and state, over lordship, exploitation, deprivation, spirit to fight against injustice? How many dedicated soldiers in the way of Allah ‘Fi Sabilillah’ are produced to spread the messege that only by embrassing the universal truth of Islam is the only way to emancipate the whole mandkind? I myself had asked many Alems(Islamic scholars)and leaders of many such Maderas but failed to get an satisfiying answer to all those questions. Most of them replied that their students would have nothing to do with state craft or politics. Their main responsibility would be preaching to people(Dawa) to be good Muslims to protect Islam. Having such wierd answer I would pose a question, If issues such as state structure, social system and politics which are related to the people are not part of Islam then how one could take Islam as a compete code of life? More remains to be said, If these issues are not inclusive in Islam then why our beloved last prophet Hajrat Muhammad(SA) had established an ideal Islamic state structure, social system in Madina and introduced in light of true Islam democratic politics? But Rasul Allah(SA) did not wait for every inhabitants of Madina to get converted into a good Muslim but took the initiative to create an ideal state, way of governance and social system as ordained by Allah in his devine revelations. At that time there was a sizable non Muslim population leaving in Madina. At the end, I told them please make me understand which country can be considered to be ‘Darul Islam’ in the whole of Muslim world. All felt uneasy and remained quite. Whoever is dedicated for the resurgence of Islam, they must think seriously on these points. They must ponder, why the Muslim Umma is devided into innumerable fractions? Why different kind of Islam is taking birth every day in the name of Fikras. In whose interest such self defeating seriously divisiveness? During the time of our esteem Prophet no such Fikras had taken birth nor there was any existance of various kind of Islam!In this context, immediately after his death what was the aim of such diviciveness, reasons, factors and conspiracy that needs to be known with clarity to the Muslim Umma. With out this endever how could it be possible to re-establish a unified Umma based on steel like unity of faith presently engaged in fratricidal conflicts all around the Globe? It might be possible to create divisions in any man made philosophy or ideology with different perspectives and analysis but there is no scope in Islam which is the compilation of devine unchangeable revelations ordained by Allah and bestowed on His last Prophet Muhammad(SA)which had been preserved in the Holy Quran during his life time of any devicisiveness in the name of Tarikas or Fikras. I strongly feel, such divisiciveness originated from power struggle. With the passage of time this concept is being accepted to be a fact to the Musims around the world. As long as true facts are not propagated openly and the Muslim Umma gets rejuvenated with the spirit of Madina to forge meaningfull unity, resurgence of Islam would never be possible. However, I also strongly beleave that the prerequisite to forge such unity, it is imperative to remove the the power elites in different countries particularly the Kingdoms and Sheik domes of the oil rich gulf states who being lackies of the imperialist powers proclaiming themselves to be the sole custodian of Islam and are directly involve in creating such diviciveness and fratricidal wars with their money power causing colossal damage to Islam just for the sake of their vested interest. If we can not fortify our own fortresses then how could we defeat the enimies of Islam? Wise people say, ‘Half educated people are more dangerous than the illiterates’. Isn’t the out come of such preposterous maneuvering to day horrifyingly visible in every predominantly Musilm country? Can’t we see in different Muslim countries a few handpicked people and families are being financed and nurtured as to be the custodians of Islam who are eluring scores of youths and young children from the down trodden families providing two squire meals and shelter? Aren’t these innocent pupils in the Madares being brain washed to be used exploiting the name of Islam as tools in their political horse trading to share sate power? For their vested interest they are not even hesitating to engage in all kinds of spiteful, malevolent and terrorist activities? At present, all these so called narrow minded cocooned custodians of Islam to perpetuate their self interest, instigation from the pay masters or any other reason are germinating factionalism and divisiveness in every Muslim country. Creating instability with religious bigotry they are taking the country and the nation backward. They are also turnishing the image of Islam by issuing ridiculous weird Fatawas(Sermons). All these ancestral clerics(Alim and Olemas)custodians of Islam only by name and shallow in knowledge are very active to let loose the oath taking students like blood thirsty Hounds of their domains of religious teaching(Maderas and Khankas) at the dictates of their masters to gagged those who dares to raise their voice for the basic rights of the common people ruthlessly to divert people’s attension using Islam as weapon. But these clergies are being heavily funded by most of the rulers of rich Muslim countries. Does this kind of patronization helps promoting Islam? With such initiatives if enimies of Islam are created within then some time in future would there be any need of enemies from out side? Similarly, These lot of Islamists are creating extremist parties and terrorist groups for their interst and interst of their foreign masters. They are being used in different country in different ways to achieve their specific interest.In some place they are also used to fight their proxy war or activating some terrorist action by their such products and worldwide propaganda is orchestrated in the controlled Media projecting Islam to be a threat to humanity, world peace and order. With this pretext after creating vaborable world opinion the world powers united as one launch armed aggression against weaker nations and take physical control of those countries or after totally destroying any country of their interest, force it to be completely dependent on them with the smoke sceen of protecting world peace and stability. These powers not only usurp the resources but also Gobelion propaganda goes on that Islam is synonymous to nothing but terrorism, fundamentalism, disorder, instability, anti humanism, backward war mongering way of life. What should be our collective responsibility to counter such malicious, distorted and false propaganda against the divinely ordainded religion Isllam which is the beacon of peace and equality for whole mandkind that must also be re-evaluated in the correct perspective. Without taking appropriate bold measures in this regard there is no scop to be an ostrich, digging faces into sand to pretend that there is no on going storm and we have done enough for the rejuvenation of Islam. We must selflessly rise over all greed and luster to rectify all the past mistakes and wrong doings. Should we fail to fullfil our responsibily then Allah shall protect His religion that has also been revealed.